Earlier this week I spoke to a group of 35 medical students going through an integrative medicine rotation at the Arizona Center for Integrative Medicine. I’ve presented in this rotation four times now and the students are always surprised that a dietitian could practice such open minded, holistic health care. Somewhere along the way, most of these students developed the inaccurate mind-set that all dietitians practice cookie-cutter, conventional, bland nutrition care. This year I presented on the biochemistry behind the anti-inflammatory diet and I highlighted the various mechanisms in which diet controls our genes to influence inflammation. I also provided a hands-on food experience for them. We prepared three “salads” that emphasized anti-inflammatory foods that contain omega-3 fats, flavonoids, antioxidants and fiber. These aren’t really what you think of when you hear “salad”. But I can’t think of another word to describe these! Curry Salmon Salad with Apples. I added about 1 teaspoon of minced ginger to my original recipe, which gave the salad a fresh “kick”. Ginger has known anti-inflammatory attributes and so I wanted to demonstrate how it could be incorporated into a variety of foods. Curried Lentils with Tofu. Inspired by this recipe from Sunset, I marinated cubed extra-firm organic tofu in olive oil, diced onions, minced garlic, minced ginger, curry and cumin and then we mixed that with canned lentils, frozen peas and shredded carrots. Ginger-Curry Quinoa Salad. 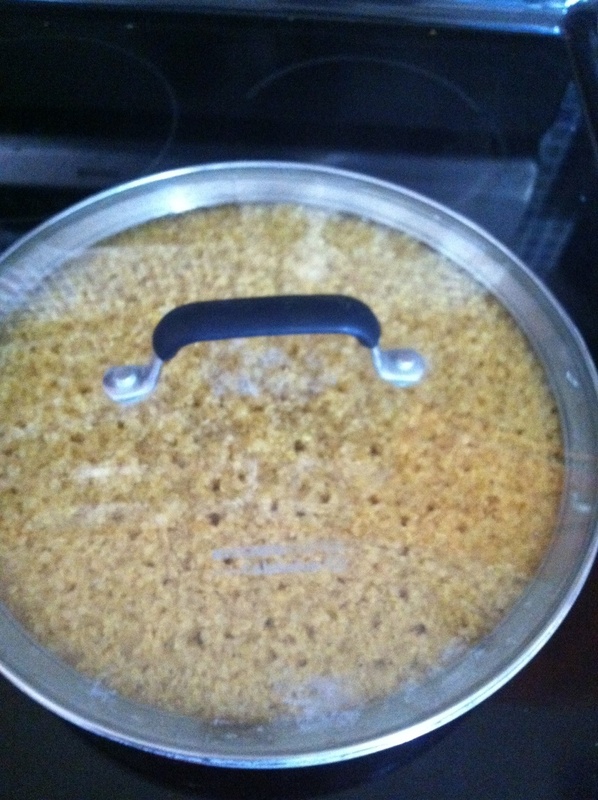 I’m loving cooking quinoa with spices! It makes the quinoa so flavorful. The whole house smelled delicious when this was cooking! It was a beautiful hue of yellow when it was done. Toast the quinoa in a warm skillet for 1-2 minutes. Add the curry and ginger. Mix around for 1 minute or so. Add the water and bring to a boil. Reduce heat and simmer until the water is absorbed. While the quinoa cooks, soak the sun-dried tomatoes and make the vinaigrette. Fill a small bowl with water. Place the sun-dried tomatoes in the water and microwave for 5 minutes or so until the tomatoes are soft enough to chop up. Chop the tomatoes and place in a large mixing bowl. Using a small glass jar, a bowl or a glass measuring cup, whisk the apple cider vinegar, curry and salt into the olive oil. Mince the parsley and chop walnuts. Add to the large mixing bowl. When the quinoa is done, add it to the large mixing bowl. Add the edamame and mix all ingredients together. I wish I had a picture of our beautiful spread to share with you. You will have to use your imagination because things were getting a little hectic with 35 students, three dishes to assemble and being short on time I was not able to take a pic. Just think of the colors and aromas that filled the room. Everyone loved the food and were inspired to get cooking! Most importantly, I provided the students with a glimpse of how what an integrative nutritionist does. How I approach and work with individuals shed a new light on the role of the dietitian in their vision of holistic health care. I am so grateful for the experience and look forward to my next interaction with them.